In my family I am known as ‘Mr Fix It’, so it was not surprised when my sister told me the other week that the power plug for her Samsung laptop computer (model number NP305) wasn’t staying put, and asked if I was able to fix it. I said yes, and took a look. It turns out this wasn’t the first time that the power socket had developed issues – when it was only six months old my sister had to send it back to the manufacturer under warranty to have the very same issue rectified. The guys at Samsung didn’t need to spend too much time fixing it – the repair sheet said that they only replaced part number BA92-09477A. Unfortunately for me that is the entire motherboard, and after discovering that the price of a new one on eBay was over AU$140, I decided not to take that route! 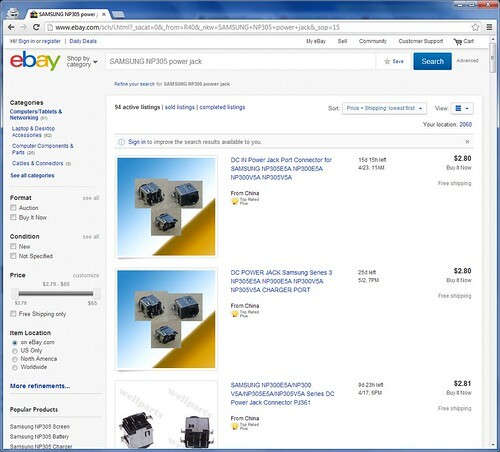 However when I continued searching I found a much cheaper option – a replacement power jack by itself. 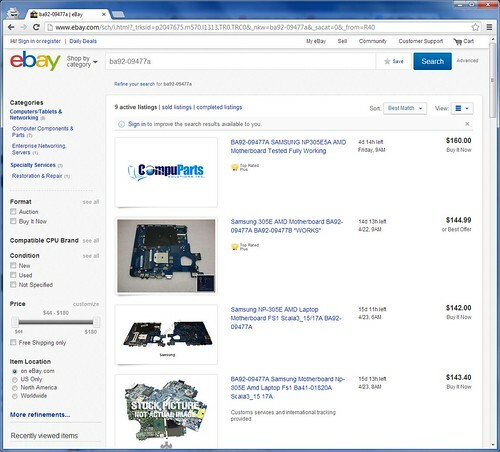 eBay sellers in China were asking AU$2.50 for a single unit with postage taking a month, while sellers in Melbourne could get it to me in a few business days for AU$10. I took the latter option! While I waited for the part to arrive, the first step of the repair was opening up the laptop. I wasn’t very successful in finding all of the screws by myself, but thankfully I found a teardown video of the Samsung NP305 laptop online. I only needed to strip down the laptop until I reached the motherboard: I was able to leave the LCD screen, keyboard, trackpad, etc all in place on the main laptop chassis. I was also able to keep the RAM, CPU and heat sink in place on the motherboard. 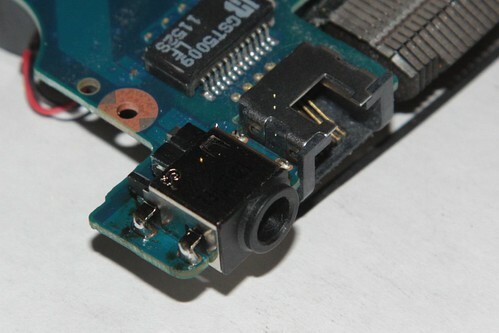 The defective power jack was attached to a corner of the motherboard, and was soldered in seven points to the motherboard: four mounting pins spaced around the edge, and two negative pins and a single positive pin at the back. But the part I received was a mirror image – when the socket was aligned to place the open socket to the left hand side, the four small mounting pins faced the opposite direction, and the positive power pin was beside the two negative pins, not offset to the side. A second problem I ran into was removing the old power socket from the motherboard. I had a solder sucker, solder wick and a soldering station all at my disposal, but getting the seven soldered joints undone was beyond me. By this point I decided to cut my losses, and just remove the old socket by cutting away the pins with side cutters, giving me clearer access for desoldering. 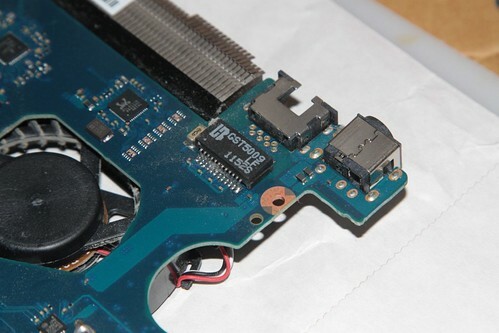 Once I wrenched the old socket free, I had a brainwave: the reason the new socket is a mirror image of the old one is because it is designed to be soldered to the opposite side of the motherboard. To test my theory, I connected both the new and old sockets to the power supply, and tested the polarity of each of the output pins – and the voltages on each pin were the same. After soldering the new socket in place, here is the finished repair. When viewed from the outside of the laptop, the most important thing to do is ensure the power socket is offset towards the RJ45 network jack alongside – failure to do this means the cover won’t fit back on! Dropping the new part into place wasn’t as simple as I though, but I eventually got it in there and soldered. The one gotcha was the position of the positive pin: it was offset from the original pad on the motherboard, so I had to bridge the gap with a short length of wire and a lot of solder. With that all done, I crossed my fingers and plugged in the power cord. Thankfully no smoke came out, just a green charging LED turning on, so I reassembled the laptop, and it booted successfully. All up I saved AU$130 compared buying a replacement motherboard, or around $50 compared to paying a laptop repair shop to to the job for me. Find the old power jack, and for for future reference make a note of which way the offset socket faces. It should be facing towards the network socket, with the blank plastic part facing the edge of the motherboard. Cut the three power pins between socket and motherboard with side cutters – these ones are a lot more harder to get access to, because of the plastic surrounding them. 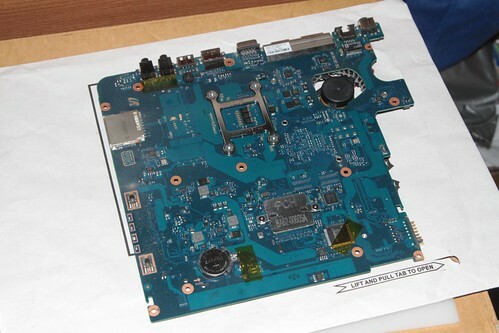 Now that the old power jack is free, remove it from the motherboard. Test your new and old power jacks side by side outside the laptop: connect them each to the power supply in turn and check that the presence of voltages between each pin are the same in both cases. Ensure you orientate the sockets in the same way each time, with the ‘extra’ bit of plastic to one side. 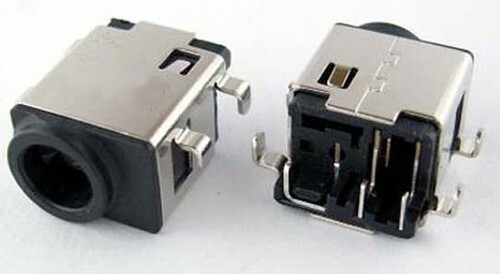 Place the new power jack into the space left behind, ensuring that the offset power socket faces in the same direction as the old one did (photo). The seven pins of the new socket will face the solder side of the motherboard (opposite side to the heat sink). Solder the four mounting pins in place, ensuring that they are pressed right up against the motherboard. Failure to do so will result in it being very hard to get the case closed correctly. Now solder in place the two negative pins to the socket: these go directly to the two solder pads located at the outside edge of the motherboard. Reassemble the laptop, ensuring that the back of the case fits easily over the new socket, and the opening in the case lines up with the jack. If it doesn’t, then you’ll need to pull it all apart again and resolder the socket. If your sister broke this twice, she needs a lecture on how to look after her laptop. I’ve got a feeling that the issue is definitely shoddy design: her previous laptop was a handed down Toshiba that I no longer needed, and it is still going strong. it is a very bad design – Samsung has come out with a unique design on this one, that is very different than any other power adapter I have laying around the house. 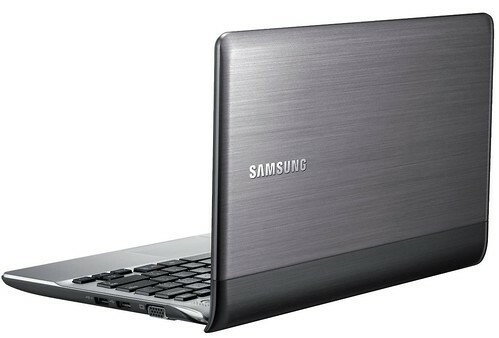 Guaranteed that every single Samsung like this will need this repair done. Its designed to fail. There are tons of articles on-line about this repair, everyone is feeling the pain. Great laptop otherwise. Samsung should issue a recall. Hopefully the replacement parts are built more fail proof than the originals. Its quite inconceivable that a power adapter can break like this.. I have some old power adapters from the 70’s that have been in use constantly since then.. they will never fail like this. They are not designed with fragile mini-prongs that will break or move out of position. 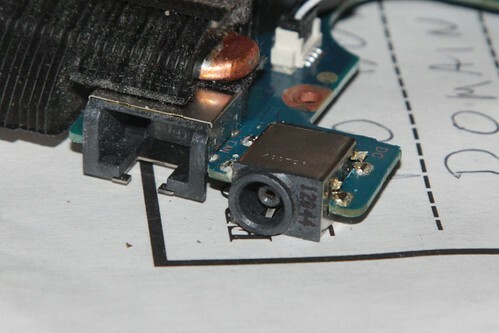 Pretty much every non-Apple laptop I’ve ever seen consists of a standard barrel plug – a single hole in the plug, and a metal pin combined with a metal sleeve at the socket end. Why mess with a standard? My problem (self inflicted carelessness I am afraid) is that the whole corner of the circuit board with the power socket has snapped off. 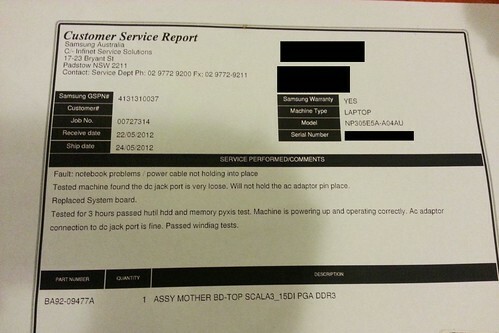 A repair shop could only suggest a new mother board. Are there any other options worth trying? Could the laptop be powered via the battery pins for example? I was really pleased with the machine while it ran, but this, plus a massive risk of disconnecting the memory cards by picking up by the wrong corner make me think it should be kept safely on a desktop and not safe for laps. Unfortunately in the case of computer motherboards, there are multiple tiny connections at multiple layers, so reconnecting everything is an impossible task. 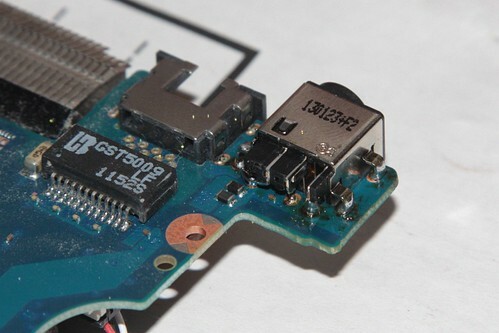 As for directly connecting a power supply to the battery connections might work, if done the right way – but if you get the wires around the wrong way then frying the motherboard is the most likely outcome. Laptop power supplies normally output a different voltage to that of the battery, which makes getting things right all the more difficult. I was worried that might be the answer. Perhaps I can find a broken one with a good motherboard. Thanks for the answer though. Best wishes. I changed the power jack but now it only works when it is plugged into the Ac adapter it will not power on from the battery. I am not sure what is wrong every thing seems to be working it charges the battery 100% Not sure what i have done wrong. Any help would be any help would be appreciated. I have this problem! 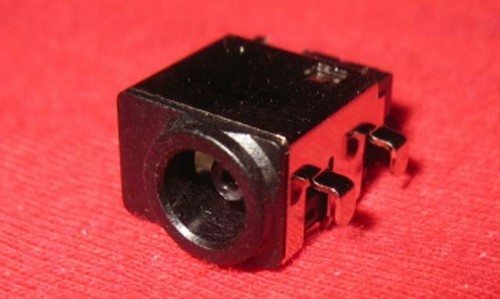 This is the first place I’ve seen it described and I suspected it might have something to do with the power jack seeing as they apparently break easily on this model. The difference is I didn’t actually replace anything. I just got the laptop handed over and I’m pretty sure the previous owner (my boss) didn’t try to repair anything. This leads me to believe that a loose connection in the power jack might cause the machine to shut down when the power cord is disconnected (or it won’t boot without the power cord in). Battery status says 100% in Windows system tray. I downloaded a battery diagnostics utility called Battery Eater which also seemed to think the battery is fine. LED charging indicator on the front alternates between amber and green when powered on with power cord plugged in. Not sure what that means. Can anyone confirm that a loose connection in the power jack can cause this?